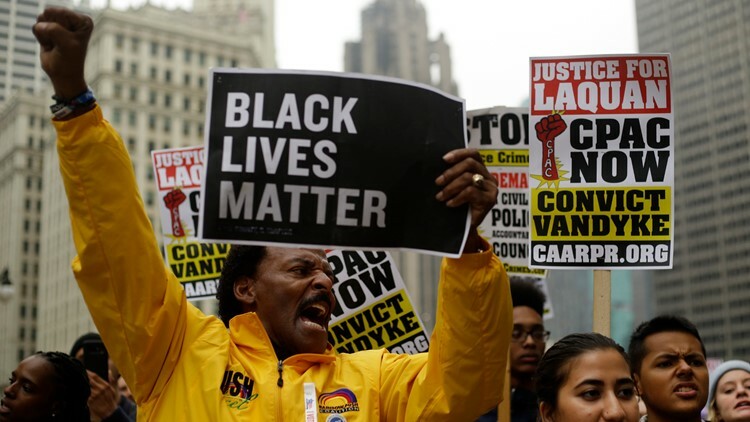 Demonstrators protest as they celebrate the verdict in the murder trial of Chicago police officer Jason Van Dyke along Michigan Avenue on October 5, 2018 in Chicago, Illinois. The judge said that after considering all of the evidence, she did not find that the officers conspired to cover up the shooting. After a trial that was watched closely by law enforcement and critics of the department that has long had a reputation for condoning police brutality and misconduct, Cook County Judge Domenica Stephenson acquittedformer Officer Joseph Walsh, former Detective David March and Officer Thomas Gaffney on charges of conspiracy, official misconduct and obstruction of justice.